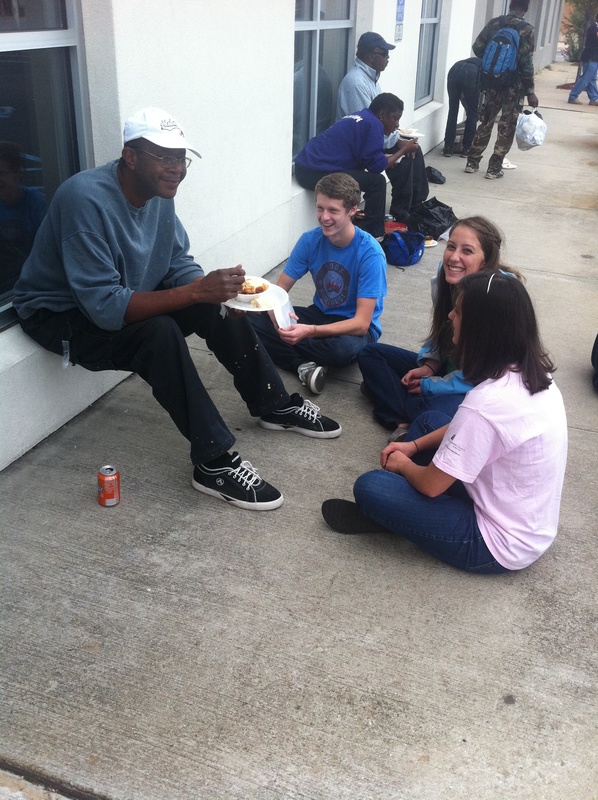 Claire (left) & Loren (right) building relationships at our Sunday downtown meal. Each month we highlight some of our key volunteers and give you the opportunity to meet some of the folks make up the Urban Purpose team. We have people of all ages, from children to senior adults, involved in the ministry on a weekly basis. As you’ll see, no matter what phase of life you’re in and what you’ve got going on, there are ways for you to plug in and show the love of Christ to the needy in your city. This week we want you to meet Loren Roth and Claire Cummings. Loren and Claire have been involved in the ministry since the spring and are a key part of what we do each week downtown. Where do y’all go to school and what grade are you in? We’re both seniors at Vestavia. Loren: I Figure skate, I’m on Rebelettes, and I teach hip hop to 4th/5th graders. I go to The Lovelady Center on Tuesdays and I’m president of NHS. Do you know where you want to go to college and what you want to study? Claire: It’s between Auburn and Alabama. I plan to study either child development or education. Claire: Hmmm… I like a lot of music! I really like Ben Rector and James Morrison at the moment. When did y’all start going downtown with Urban Purpose? I think we started going in February or March of our junior year. Talk a little bit about having the opportunity to serve alongside your close friend(s)? Loren: Claire and I have been friends for a long time, but I have learned the most about her and her relationship with Christ through conversations we have had together with the people downtown. Also, I really like having someone there to keep me accountable to come back week after week and to pray for the needs of the people we meet each week. Claire: It’s neat to watch my friends grow spiritually by being the hands and feet of Jesus on a consistent basis. The impact it has on their lives is so evident. Loren and I have become even closer friends by meeting and serving these people together. What has God taught you through serving with Urban Purpose? Loren: God has taught me the importance of prayer. Whether it may be seeing the negative affects of a lack of prayer in someone’s life or seeing how my consistent prayers really do bring about change in my life and in others, God has reassured me that our prayers are heard and our prayers are powerful. Claire: There is an abundance of needs all around us, and God is teaching me so much about what it means to do what I can with a servant’s heart. It might mean serving a meal, hugging a homeless woman before she goes on her way, handing out hygiene kits, or just exchanging jokes and laughing with a homeless man. The smiles on their faces and the fact that they come back most every week shows me that what I can contribute truly does affect the Kingdom. Over the course of the last two years God has blessed Urban Purpose more than any of us could have imagined. What started as building relationships with a small group of men and women living under I-65 has developed into an opportunity for believers all over our city to share the gospel with those in need and mentor and disciple them to live the lives God has for them. As we look forward to 2012 and beyond there is so much to be done right here in our city. By the end of 2011 it is our goal to have 150 monthly financial supporters. This base of support will allow us to continue the process of building relationships, offering opportunities to serve, providing access to drug and alcohol recovery, and helping those rebuilding their lives find employment and housing. We would love for you to pray about being one of the 150 monthly financial supporters that allow us to continue doing the work God has called us to do. If you feel led to financially support Urban Purpose you can click the following link to sign up for a recurring payment: Donate. If you have any questions about the ministry feel free to contact us at info@urbanpurpose.org. Thanks so much for your prayers and support. Perceptions & Reality: How Do We View The Homeless? Most of us have had these thoughts at one time or another about a homeless person. We see them panhandling at exit ramps, sitting in parks, or walking through the streets of downtown and most of the time we lock the doors, take a different route to where we’re headed, or simply avoid eye contact. Every now and again we give one of them a few bucks or buy them a combo meal at the nearest fast food joint because we want to help, but aren’t really sure what to do. Whatever your response is…whether it’s a derogatory thought, avoidance, or a couple of bucks…where does it come from? Why do you react the way you do? Is your response based on experience or preconceived ideas? Be honest here, you won’t be judged or blasted for your answers. Like we mentioned above, almost all of us have had the same thoughts and reactions at some point in our lives. Over the course of the next few weeks we’re going to continue this discussion. We want to start here with our initial thoughts, feelings, and reactions to the homeless. Our aim through this discussion is to wrap up with a well thought out approach to how we can biblically and responsibly approach the homeless right here in our city. So, let it rip and give us your honest thoughts. We’re looking forward to the discussion over the next few weeks. What’s the Answer to Birmingham’s Homeless Issue? 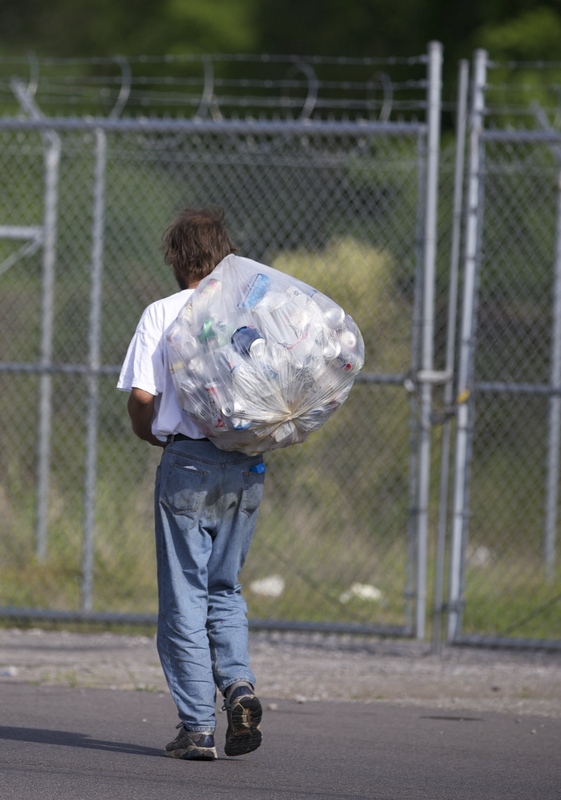 Here is an article from The Tennessean on how to fix Nashville’s homeless problem. The city of Birmingham has a homeless population of approximately 3,000. So, we obviously have an issue on our hands as well. Do you agree with the author’s take on how the issue should be addressed? What are your thoughts? What do you think is the solution to the issue? Should this come through the government? The church? Click on the link below and share with us your comments and questions. Jared Morgan, one of our volunteers, walks you through a few minutes of our Sunday meal. This is a glimpse into what we do each and every Sunday. As you’ll see, there are ways for everyone to get involved and serve those in need right here in our community. Our Sunday meals are our open door to get to know men and women on the streets and begin the process of building relationships. 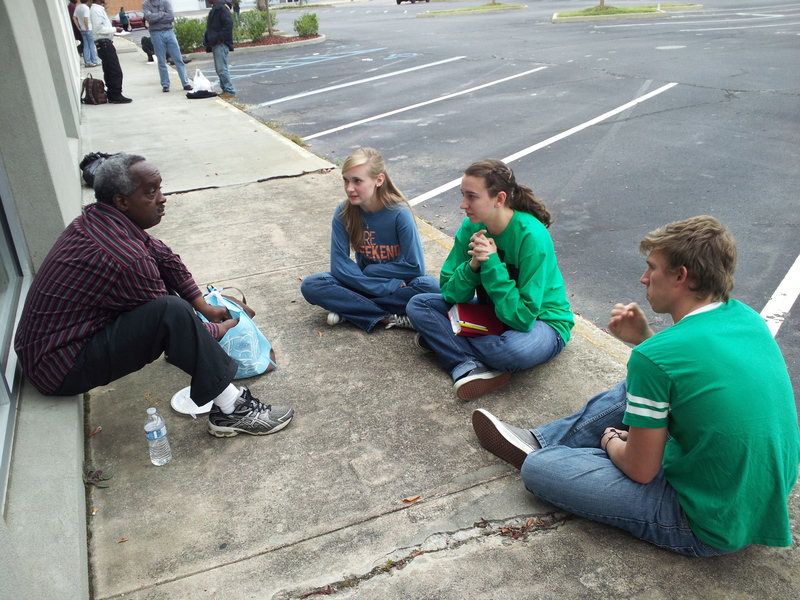 From here we are able to share the gospel and tell people more about what we do and how we can help. We meet every Sunday at the Shades Mtn. Baptist Student Building at 2:30pm and are back by 4:30pm. Check out our website at http://www.urbanpurpose.org for more information.